Carl Pelletier and Steve Heidner on the starting line at Las Vegas before the burn out. Don't breathe the Nitro fumes. 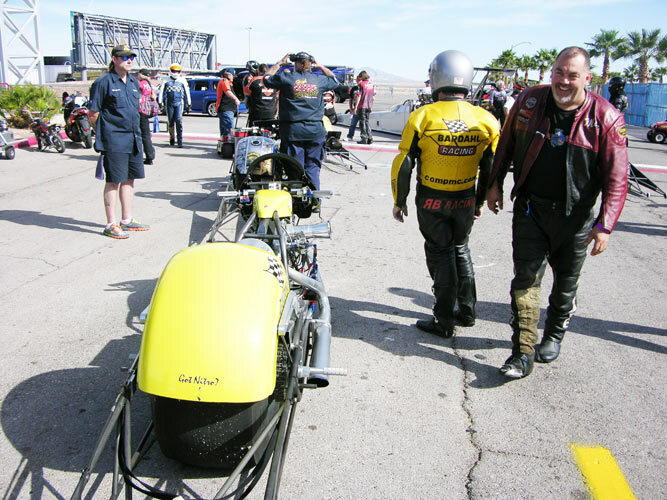 Steve Heidner runs a personal best of 6.53 and 204 mph but the "bump" in the 15 bike field was 6.49 so only the top eight matched off against each other. 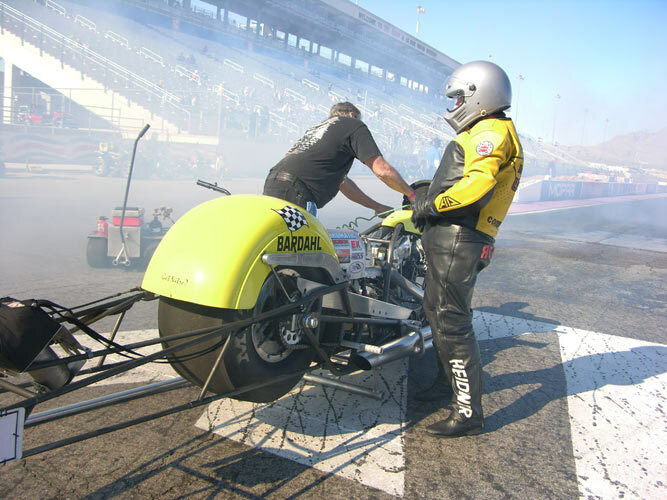 Carl Pelletier's Competition Motorcycles Top Fueler of Boise Idaho: Carl and Steve worked on clutch and fuel management and came up with a pretty good tune that pulled all the way through the lights but just missed the 6.49 "bump". With the abbreviated schedule and the folding of the AHDRA organization Carl has only three races on the West Coast to sort things out. 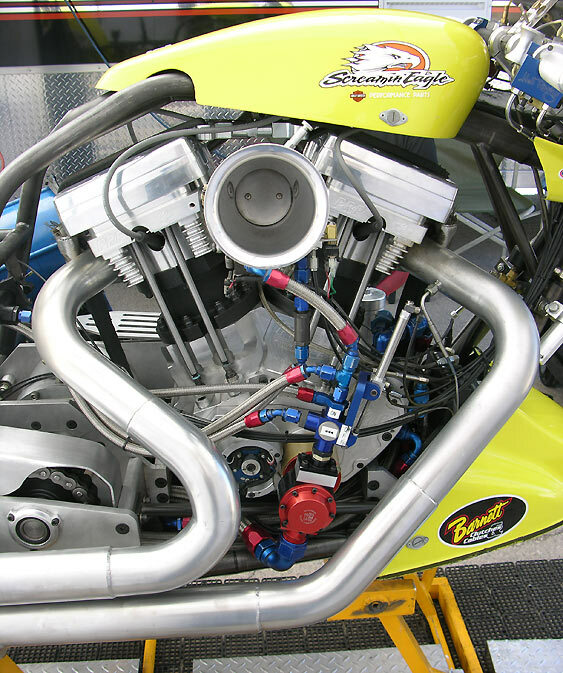 The NHRA has expanded its involvement with Top Fuel Harleys as they are crowd pleasers...The bikes are really loud, the spectators can see the riders, and there are no roll cages. Additional events have been added to the NHRA's schedule to increase an awareness of the sport. They w are way more nasty that their Pro Stock brothers. Here Steve is suited up and ready to make one left turn to the starting line. 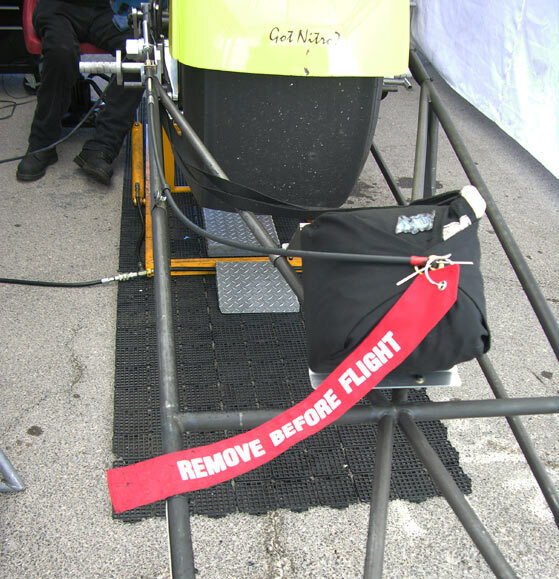 You push the bike to the starting area...Upon the stand, fire it, do a burn out, wipe the water off the front tire, pull the safety clip to arm the parachute, flip on the RacePak Data Recorder and shoot the tire and track temperatures. Stage and then nail it. Wheelie on the 14" slick to the lights. 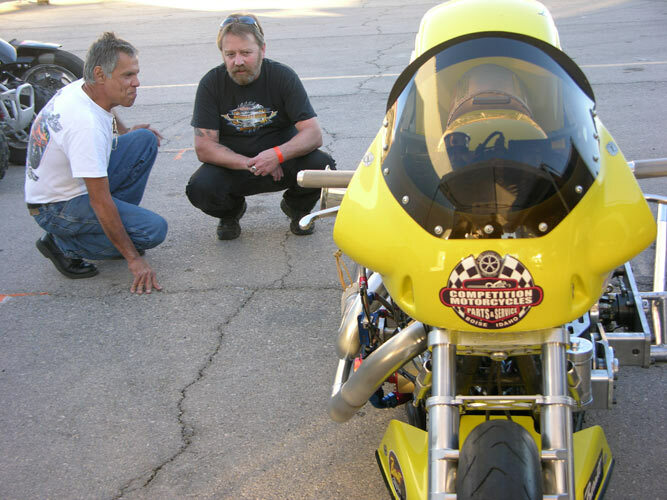 Harley Pro Stock racer Hector Arana stopped by the pits to discuss Top Fuel Bikes with Steve Heidner. 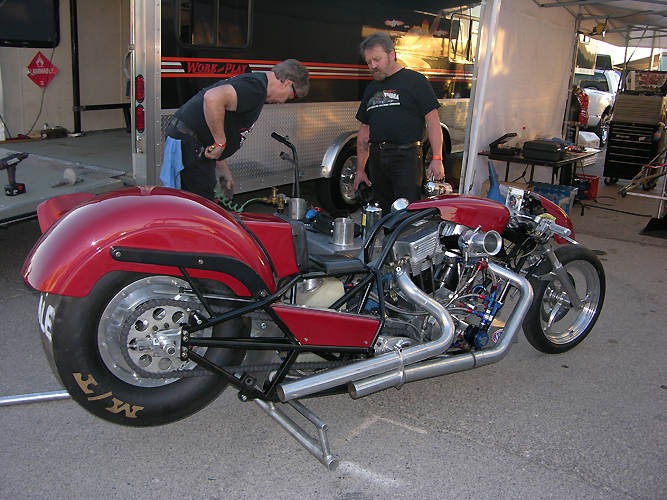 Both Steve and Hector run in the "Sixes" on their resepective Harley race bikes. 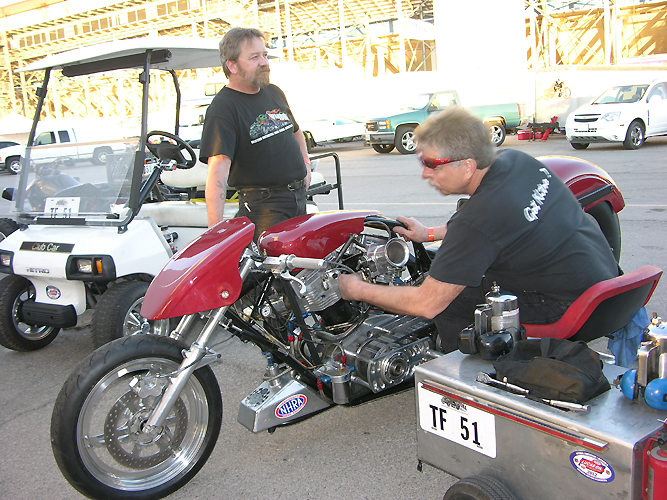 15 Top Fuel bikes showed up for the event to put on a show for the crowd. Weather was perfect with little wind and clear skies. This is the antidote for running out of brakes and off the end of the race track. 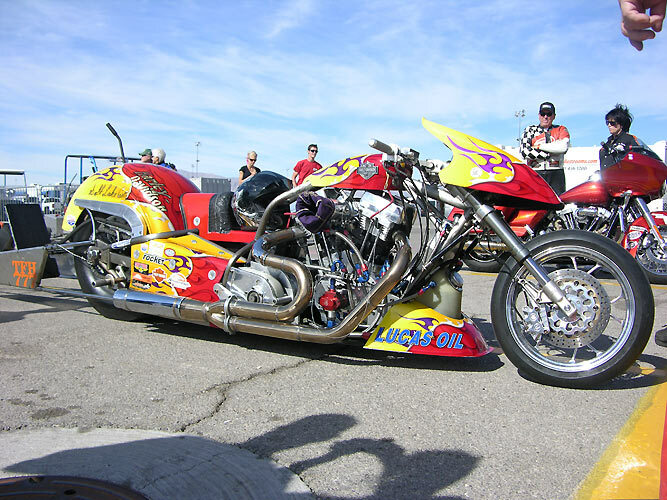 Pretty much standard on all Top Fuel Harleys these days. It settles the bike down with their bouncing 14" rear slicks and their skinny front tires. If you have some extra cash laying around Carl has this Fueler for sale. Takes about 30 large to get your hands on it. Get ahold of Carl at Competition Motorcycles.